FERNCOURT was built as a private home in 1889. This painted lady has 17 rooms and 8 bathrooms. Guests may choose from 6 lovely bedrooms each individually decorated All have private baths, ceiling fans, central heat and air. FERNCOURT is located in tiny San Mateo in North Central Florida. Just a short 25 minute drive into downtown St, Augustine, it offers the perfect get-a-way for a restful weekend or for seeing the sights in the country's oldest city. 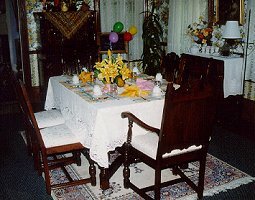 Breakfast at FERNCOURT is a time for meeting the other guests and enjoying a delicious meal. Specialities of the house include RICE PUDDING and BREAKFAST CHEESECAKE. Dee Dee loves to cook and eggs provided by her own hens are always on the menu in some form. For Bed & Breakfast The Victorian Way. Ferncourt is listed in the superior small lodging of Florida. 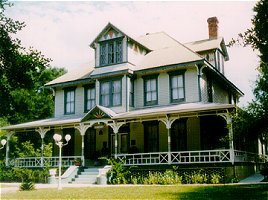 We are also members of Bed and Breakfast Inns of Florida. Rates are $65 to $85. Major Credit Cards accepted. Romantic Country Inns, Getaways and B&Bs offer a great San Mateo lodging alternative to big hotels.